In the spirit of a recent article by guest writer "Wildcat" we have decided to do some "comparison shopping" between Christian ThinkTank webmaster Glenn Miller and Secular Web denizen Richard Carrier on the subject of the Lukan census, correlating with material from perhaps the most recent look at the issue by Stanley Porter in "The Reasons for the Lukan Census" in Paul, Luke and the Greco-Roman World. Over the years we have deferred to Miller on this subject and will continue to do so. However, an analysis like this did seem beneficial. In this analysis we will not address solutions criticized by Carrier that we or Miller do not agree with or mention. This will be a strict point-to-point comparison, with additions by Porter as needed. Miller's item will form the template for comparison order. Point 1: Double Quirinius. Miller offers as a possible answer a familiar idea that Quirinius served a post in Syria twice -- once when all agree that he did, and a second time at the time of Jesus. Also, it is worth noting that we have a MS that describes a soldier who was 'legate of Syria' TWICE during this timeframe. There are two main interpretations of this MS: one is that it refers to Q. Varus (placing Quirinius as a procurator during the birth of Christ), and the other that it refers to Quirinius himself.
" A Latin inscription found in 1764 about one-half mile south of the ancient villa of Quintilius Varus (at Tivoli, 20 miles east of Rome) states that the subject of the inscription had twice been governor of Syria. This can only refer to Quintilius Varus, who was Syrian governor at two different times. Numismatic evidence shows he ruled Syria from 6 to 4 B.C., and other historical evidence indicates that Varus was again governor from 2 B.C. to A.D. I. Between his two governorships was Sentius Saturninus, whose tenure lasted from 4 to 2 B.C. Significantly, Tertullian (third century) said the imperial records showed that censuses were conducted in Judea during the time of Sentius Saturninus. (Against Marcion 4:7). Tertullian also placed the birth of Jesus in 3 or 2 B.C. This is precisely when Saturninus would have been governor according to my new interpretation. That the Gospel of Luke says Quirinius was governor of Syria when the census was taken is resolved by Justin Martyr's statement (second century) that Quirinius was only a procurator (not governor) of the province (Apology 1:34). In other words, he was simply an assistant to Saturninus, who was the actual governor as Tertullian stated." The most obvious problem with this piece of "evidence" is that it doesn't even mention Quirinius! No one knows who this is. Numerous possible candidates have been proposed and debated, but the notion that it could be Quirinius was only supported by the wishful thinking of a few 18th and 19th century scholars (esp. Sanclemente, Mommsen, and Ramsay). But it is unlikely to be his. We know of no second defeat of a king in the career of Quirinius, though Tacitus writes his obituary in Annals 3.48, where surely such a double honor would have been mentioned, especially since a "victory celebration" was a big deal--involving several festal days of public thanksgiving at the command of the emperor. We also have no evidence that Quirinius governed Asia. Though that isn't improbable, we do know of another man, Lucius Calpurnius Piso, who did govern Asia and who defeated the kings of Thrace twice, and received at least one "victory celebration" for doing so, as well as the Triumphal Decoration, and who may also have governed Syria. Though it cannot be proved that this is Piso's epitaph, it is clear that it would sooner belong to him than Quirinius. Thus, to ignore him and choose Quirinius would go against probability. Yet even if we lacked such a candidate as Piso, to declare this an epitaph of Quirinius is still pure speculation. Even more importantly, this inscription does not really say that the governorship of Syria was held twice, only that a second legateship was held, and that the second post happened to be in Syria. From what remains of the stone, it seems fairly obvious that the first post was the proconsulate of Asia. This means that even if this is the career of Quirinius, all it proves is that he was once the governor of Syria. Carrier's reply leaves a number of unanswered questions. He notes Tacitus' lack of a second mention, yet also notes that Piso "received at least one 'victory celebration'" -- which seems to imply that there is no evidence for such a celebration for his second. What source lacks this evidence? Is it Tacitus or another writer? If it is, then any strangeness of Tacitus not mentioning a "double honor" becomes moot. Porter  confirms that the "grammar of the Latin has been interpreted to mean not that he received Syria and Phoenicia 'again', but that he was 'again' legate, this time of Syria and Phoenicia". But Miller's answer is NOT that the inscription refers to Quirinius, but rather to Varus. Porter  seems to allude to this idea, noting that Ramsay argued for "some kind of split responsibilities" with Varus, but he does not reply to it. He does note that it is either Piso or a certain M. Plautius Silvanus who most scholars think is the subject of the Tivoli inscription. Another proposal is that hêgemoneuontos tês Syrias might mean simply "holding a command in Syria" and since Quirinius is known to have fought a war in Asia Minor between 6 B.C. and 1 B.C., perhaps Luke means to refer to the time when Quirinius was fighting this war, and not actually "legate of Syria." This doesn't acually solve any of the problems already discussed so far--no census of Judaea could have been held before 6 A.D. But the argument is not even reasonable to begin with. First, it makes no sense to date an event in Judaea by referring to a special command in a war in Asia. Why not simply name the actual legate in Syria? There is no reason to pass over the most obvious man and name another who has absolutely nothing to do with Judaea, much less a census there. We will discuss matters of censuses being held later. The comment is interesting, however, because it would be Carrier's contention that Luke fouled up history and didn't have his facts straight. If for some reason Luke was unable to verify who was legate in Syria at the time, we have a very good reason to name rather a person known by a special command instead. But Miller's argument is rather that Quirinius was a procurator. Carrier only mentions Justin in a footnote and interprets his words to mean that he thought Jesus was born 6 AD! In what follows Carrier continues to address the idea of a "special command" at issue, but this is not Miller's argument so there is no place for comparison. To get around the problem that all the governors of Syria between 12 and 3 B.C. are already known, some have tried to argue that Quirinius was actually holding a dual governorship with one of those other known governors. This is truly a desperate ad hoc argument, for there was never any such thing as a dual governorship under the Roman Empire, and it would be very strange if there were. It also does not solve the problem of the census--for even if Luke was referring to an earlier date, there could not have been a census of Judaea then, as shown above. Could Luke mean that Quirinius was prefect of Syria under a superior official? Besides the fact that it is illogical to name the second in command rather than the actual governor, Quirinius had been a Senator of consular rank since 12 B.C. and thus could never have been a prefect, who had to be of equestrian rank. Other than the difference in title (prefect vs. procurator) this is essentially Miller's argument. Does it make a difference? Elsewhere Carrier has noted that the two offices were held by the same person (as was the case with Pilate). But were they also separable, and did the rank of procurator require such rank? In comparing the two writers' arguments these are questions that come to mind. On the surface one would also like to know how this fits with Josephus' statement, cited by Carrier: "Quirinius was a man of the Senate, who had held other offices, and after going through them all achieved the highest rank." And curiously enough, even if that were NOT the case somehow, the linguistic data of the last few decades indicates that Luke 2.1 should be translated 'BEFORE the census of Quirinius' instead of the customary 'FIRST census of Quirinius'--see Nigel Turner, Grammatical Insights into the New Testament, T&T Clark: 1966, pp. 23,24 and Syntax, p. 32. This would 'solve the problem' without even requiring two terms of office for Q.
Miller says nothing else about this option, but Carrier has a great deal to say, as does Porter. We shall endeavor to match up Porter's remarks with Carrier's. Some have tried to argue that the Greek of Luke actually might mean a census "before" the reign of Quirinius rather than the "first" census in his reign. As to this, even Sherwin-White remarks that he has "no space to bother with the more fantastic theories...such as that of W. Heichelheim's (and others') suggestion (Roman Syria, 161) that prôtê in Luke iii.2 means proteron, [which] could only be accepted if supported by a parallel in Luke himself." He would no doubt have elaborated if he thought it worthwhile to refute such a "fantastic" conjecture. For in fact this argument is completely disallowed by the rules of Greek grammar. First of all, the basic meaning is clear and unambiguous, so there is no reason even to look for another meaning. The passage says autê apographê prôtê egeneto hêgemoneuontos tês Syrias Kyrêniou, or with interlinear translation, autê(this) apographê(census) prôtê[the] (first) egeneto(happened to be) hêgemoneuontos[while] (governing) tês Syrias(Syria) Kyrêniou[was] (Quirinius). The correct word order, in English, is "this happened to be the first census while Quirinius was governing Syria." This is very straightforward, and all translations render it in such a manner. If indeed this is "completely disallowed by the rules of Greek grammar" one wonders how such luminaries as Turner, as well as others named by Porter (Lagrange, Llewelyn, Kearsley, and also, N. T. Wright in Who Was Jesus , certainly no slouch in the Greek department) were not informed of this. The appeal to the authority of translations is curious and we rather doubt if Carrier would appeal to such authority any other time than when it suited his purposes. It does not matter if Luke meant that he knew of a second census under Quirinius, since we have already shown that if there were one it would have occurred some time after 6 A.D. Nevertheless, the passage almost certainly does not mean this. We have no reason to believe Quirinius served as governor again, or long enough to conduct another census, and the Greek does not require such a reading. It seems that this argument is not the same as what Miller advances, which is not that there is reference to a second census UNDER Quirinius, but this was the census before the census of Quirinius. We have noted above as well that the issue is not of a governorship. The use of the genetive absolute (see below) means one can legitimately put a comma between the main clause and the Quirinius clause (since an absolute construction is by definition grammatically independent): thus, this was the first census ever, which just happened to occur when Qirinius [sic] was governor. The fact that Luke refers to the census from the start as the outcome of a decree of Augustus clearly supports this reading: this was the first Augustan census in Judaea since the decree. Another observation is made by Klaus Rosen, who compares Luke's passage with an actual census return from Roman Arabia in 127 A.D. and finds that he gets the order of key features of such a document correct: first the name of the Caesar (Augustus), then the year since the province's creation (first), and then the name of the provincial governor (Quirinius). Luke even uses the same word as the census return does for "governed" (hêgemoneuein), and the real census return also states this in the genitive absolute exactly as Luke does. This would seem an unlikely coincidence, making it reasonable that Luke is dating the census the way he knows censuses are dated. The only fault with Rosen's thesis (apart from the fact that Luke's passage lacks a lot of other typical features of a census return, e.g. the year of the emperor) is that he assumes the prô:tê refers to a year since every province begins with a census. Instead of adopting such an assumption, it is simply more reasonable to take the language at its plain meaning: the first Augustan census, which happened under Quirinius. But even if one wanted to render it differently, the basic rules of Greek ensure that there is absolutely no way this can mean "before" Quirinius in this construction. What is usually argued is that prôtê can sometimes mean "before," even though it is actually the superlative of "before" (proteros), just as "most" is the superlative of "more." Of course, if "before" were really meant, Luke would have used the correct adjective (in this case, proterê), as Sherwin-White implies, since we have no precedent in Luke for such a diversion of style. Porter [173-4] seems to reject this position: "As a number of scholars have shown, and as the Greek grammars clearly indicate, there are a number of passages in ancient Greek, from Homer to the Hellenistic period, that illustrate that the Greek superlative adjective can have comparative force, either without or with a comparative item in the genitive." Porter lists some arguments against this idea and we will endeavor to match them with Carrier's. One match is already made with the retort that "we have no precedent in Luke" for such a stylistic diversion. Porter replies [174-5] that "there are in fact instances of the comparative use of the superlative form in the Lukan writings, as well as in the rest of the New Testament," though Porter only notes Acts 1:1 in Luke's work (which raises the interesting point that it would suggest that Luke had a third volume in mind). 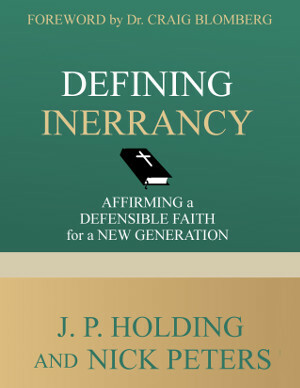 Porter also adds, "...to make the argument that within a limited corpus such as a single New Testament writer all linguistic phenomena must be found not once but twice before interpretation or understanding can take place is simply absurd. The Greek of the New Testament must be understood in the context of its larger Hellenistic usage." But there is a deeper issue involved. The word prôtê can only be rendered as "before" in English when "first" would have the same meaning--in other words, the context must require such a meaning. For in reality the word never really means "before" in Greek. It always means "first," but sometimes in English (just as in Greek) the words "first" and "before" are interchangeable, when "before" means the same thing as "first." For example, "in the first books" can mean the same thing as "in the earlier books" (Aristotle, Physics 263.a.11). Likewise, "the earth came first in relation to the sea" can mean the same thing as "the earth came before the sea" (Heraclitus 31). Nevertheless, what is usually offered in support of a "reinterpretation" of the word is the fact that when prôtos can be rendered "before" it is followed by a noun in the genitive (the genitive of comparison), and in this passage the entire clause hêgemoneuontos tês Syrias Kyrêniou is in the genitive. But this does not work grammatically. The word hêgemoneuontos is not a noun, but a present participle (e.g. "jogging," "saying," "filing," hence "ruling") in the genitive case with a subject (Kyrêniou) also in the genitive. Whenever we see that we know that it is something called a "genitive absolute" construction, and thus it does not make sense to regard it as a genitive connected to the "census" clause. In fact, that is ruled out immediately by the fact that the verb (egeneto) stands between the census clause and the ruling clause--in order for the ruling clause to be in comparison with the census clause, it would have to immediately follow the adjective "first," but since it doesn't, but the entire clause is distinct from the rest of the sentence, it can only be an absolute construction. A genitive absolute does have many possible renderings, e.g. it can mean "while" or "athough" [sic] or "after" or "because" or "since," but none allow the desired reinterpretation here. John 1:15 (and 1:30) is a case in point: the verb emprosthen is already used (the first "before" found in English translations of the verse) in order to establish the context, and then comes hoti prôton mou ên, "because he was first [in relation] to me." So here we have an example of when prôtos means "before," yet all the grammatical requirements are met for such a meaning, which are not met in Luke 2.2: the genitive here is not a participle with subject, but a lone pronoun (thus in the genitive of comparison); the genitive follows immediately after the adjective; and the previous use of emprosthen establishes the required context. Thus, this is clearly not the same construction as appears in Luke 2.2. Another example is the use of this construction in Acts 16:12, where again the sentence can be rendered "first in relation to" and only then can it be simplified in English to "before." No such license is allowable in Luke 2.2. As a genitive absolute the Quirinius clause cannot have any grammatical connection with prô:tê, and "first in relation to the reign of Quirinius" would not produce the meaning "before" anyway. ...Pearson has made a plausible case for how to understand the construction in Luke 2.2 as a genitive absolute that is dependent upon the preceding independent clause, marshalling examples from Luke-Acts that show the flexibility of the genitive absolute construction. Further, there are numerous examples of dependent participles being used in the genitive case in predicative constructions, both in the Greek of the New Testament and in extra-Biblical Greek. However, it may be that the analysis of the particular construction is not to be understood as a genitive absolute at all but with the noun, [kuernios], as the genitive of comparison, and with the participle [hêgemoneuontos] attributively modifying this noun. In this case, the construction, though often referred to as a genitive absolute, may more resemble a simple modifying participle, which is found frequently in both extra-biblical and New Testament usage, in all cases. Luke's Nativity story hinges on its `decree from Caesar Augustus that all the world should be taxed.' `Caesar Augustus' was the Roman Emperor, but if the Nativity took place in the reign of the King Herod the Great, the Jews were still Herod's subjects, members of a client kingdom, not a province under direct Roman rule. Whether conducted by Quirinius or anyone else, there could not have been a census in Judaea before 6 A.D., since the province had not entered direct Roman control before then. In contrast, we know that such control always entailed a census, because it initiated Roman direct taxation for which the census existed. Since Quirinius is the first Roman magistrate to control the province, we expect a census to occur at that time. So we expect a census in 6 A.D., and not before. This is due to the nature of Roman imperialism. The whole point of a client kingdom, as Judaea was in the time of Herod, was that the kingdom retain its independence while paying a set and agreed annual tribute--many territories received this special status for cooperating with Rome in important wars, or when Rome did not want to trouble itself with running the province directly, and typically these client states surrounded and protected the borders of the Empire, providing a kind of buffer zone against invasions. To conduct a census in contravention of such an alliance would have been a notable event indeed, mentioned in many other places as the peculiar event that it would have been--even if it did not start an outright war, as almost happened when the Romans finally did conduct a census in Judaea, once they were in direct control. Why, after all, would Rome want a census of a territory it was not taxing directly? Such a thing was never done at any time in the history of Rome. Horst Braunert's study of the subject "disproves conclusively the notion of a Roman census before the creation of the province" while also demonstrating that a census was "a necessary consequence of the establishment of direct provincial government." The relationship between Augustus and King Herod had its ups and downs, indeed, but the argument that his Roman-granted title of king meant that his nation was exempt from taxes/tribute/census is just flat wrong. As I hinted at up above, it had become a tribute-paying tributary since its conquest by Pompey LONG BEFORE King Herod gets his title! (more below on this).
" A sixth reason for placing the nativity of Jesus in 3 or 2 B.C. is the coincidence of this date with the New Testament account that Jesus was born at the time when a Roman census was being conducted: "There went out a decree from Caesar Augustus, that all the [Roman] world should be registered" (Luke 2:1). Historians have not been able to find any empire-wide census or registration in the years 7-5 B.C., but there is a reference to such a registration of all the Roman people not long before 5 February 2 B.C. written by Caesar Augustus himself: "While I was administering my thirteenth consulship [2 B.C.] the senate and the equestrian order and the entire Roman people gave me the title Father of my Country" (Res Gestae 35, italics added). This award was given to Augustus on 5 February 2 B.C., therefore the registration of citizen approval must have taken place in 3 B.C. Orosius, in the fifth century, also said that Roman records of his time revealed that a census was indeed held when Augustus was made "the first of men"--an apt description of his award "Father of the Country"--at a time when all the great nations gave an oath of obedience to Augustus (6:22, 7:2). Orosius dated the census to 3 B.C. And besides that, Josephus substantiates that an oath of obedience to Augustus was required in Judea not long before the death of Herod (Antiquities I7:4I-45). This agrees nicely in a chronological sense with what Luke records. But more than that, an inscription found in Paphlagonia (eastern Turkey), also dated to 3 B.C., mentions an "oath sworn by all the people in the land at the altars of Augustus in the temples of Augustus in the various districts." And dovetailing precisely with this inscription, the early (fifth century) Armenian historian, Moses of Khoren, said the census that brought Joseph and Mary to Bethlehem was conducted by Roman agents in Armenia where they set up "the image of Augustus Caesar in every temple.''. The similarity of this language is strikingly akin to the wording on the Paphlagonian inscription describing the oath taken in 3 B.C. These indications can allow us to reasonably conclude that the oath (of Josephus, the Paphlagonian inscription, and Orosius) and the census (mentioned by Luke, Orosius, and Moses of Khoren) were one and the same. All of these things happened in 3 B.C." Carrier offers nothing that seems to directly reply to this; perhaps he saw no need, because the date did not match. A footnote he offered may be something to this effect, and there is some language which suggests that he finds that the language of this sort of decree does not match with a census as Luke describes, but he refers to a counting by Herod, not by Rome. In a note he adds, "Though there may have been an annual oath-swearing by the people subject to Rome (made on the anniversary of the emperor's accession), Judaea was not yet subject to Rome." This is the closest statement, it seems, to what Miller offers, yet it is clear that "subject" or not, Josephus does record that the oath was administered in Judaea. Porter meanwhile offers an extensive analysis concerning property returns [176ff] and of the suggestion that the census was one of property, not people, of which, there also seems to be no matching analysis from Carrier, though he cites some of the same sources as Porter. Our conclusion: This is a complex topic and Carrier's definitive "it didn't happen" conclusion is unwarranted. The conclusions of Porter ("...there is growing evidence from what we know of ancient census-taking practices to believe that in fact Luke got far more right in his account that he got wrong") and Miller at this stage seem much stronger, though Carrier's work may seem stronger only because he addresses so many arguments that were of little merit to begin with. A reader alerted me to some interesting links related to this, here and here.